Here I am in all my 39 week glory. My mama said I look like a 1970’s hippie lady – all peaceful in the grass. I guess I could buy it, except for the background cars giving away the 2012 reality. Oh, and the fact that I’m wearing a bra. Mama seriously can’t wait to meet you and neither can anyone else in the family! It’s starting to get warmer and I’m running out of maternity clothes that fit well, so you are welcome to emerge at any time. Then again, I do feel at peace just waiting until you’re ready. Aunt Hannie had a dream that you were born the other night and you came super fast! I won’t complain if you are swift, that’s for sure. In Hannie’s dream you came so quickly that we had nothing ready so Hannie sacrificed her brand new Nordstrom scarf to wrap you up. Isn’t that just the sweetest? I’m feeling so excited to have a little guy in my life. There are still so many unknowns, but I know you and I will be the best mama/Brother duo ever! How big is baby? The size of a watermelon, and boy, does it feel like that! A wiggling watermelon! Maternity clothes? Yes! And some of them are even too small. Although, the dress I’m wearing above is just a normal person maxi dress. So comfy. Best moment of the week? I’ve felt really good the last few days, more energy, sleeping a wee bit better, and staying cool even though summer has finally arrived in the PNW. I felt so good that I whipped up a bath of cookies yesterday to enter into the county fair’s cookie competition. I walked away with a blue ribbon and a $25 gift certificate to one of my favorite restaurants! Movement? I can tell Brother is running out of room – he bumps around, but it’s getting tight in there. What I am looking forward to? Brother’s Birth Day, of course! Shopping for? Nothing we need. Especially after I ordered this super fabulous new purse/diaper bag. I love that there is a middle section for mama’s stuff, one side for Jem, and one side for Brother. P.S. Use code GUSSY for 25%! Name ideas? We’re for sure waiting to meet the little guy before finalizing anything. Part of me is worried that we’ll end up with a nameless boy for a bit. Well, we’ll probably keep calling him Brother, so at least he won’t be nicknameless. Reading? Just started Raising Cain: Protecting the Emotional Lives of Boys, so far so good! Weekly wisdom? Staying busy near “the end” helps keep things in perspective. Baby will come when baby is ready. You look beautiful! Hope he comes soon for you! You look so cute! Almost there! Glad someone understands! I just had to splurge on a pair of stretchy lounge shorts just to get me through these last few days! Its been HOT! 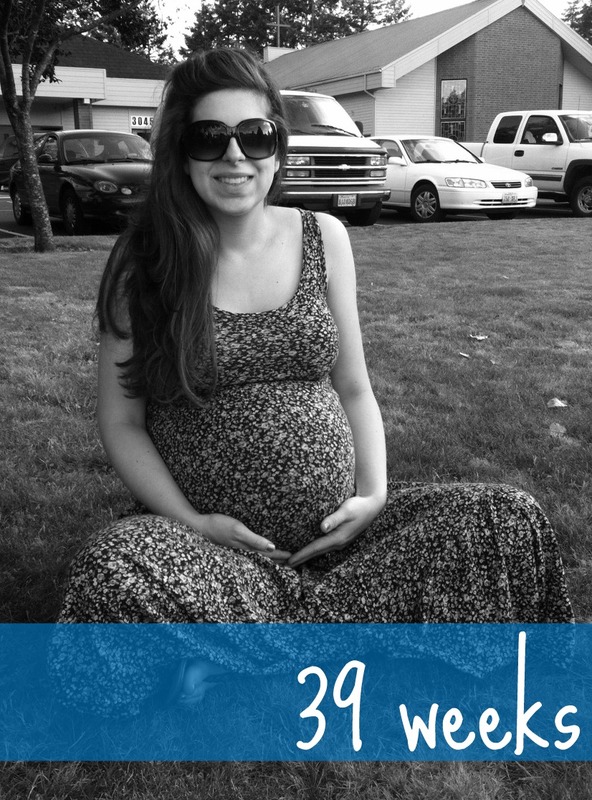 … and I can't wait to share about his arrival :) I'll keep you all posted for sure!